Sunnyvale, California – 27 October 2016 — Today AMD unveiled a new family of power-efficient graphics processors, Radeon Pro 400 Series Graphics. 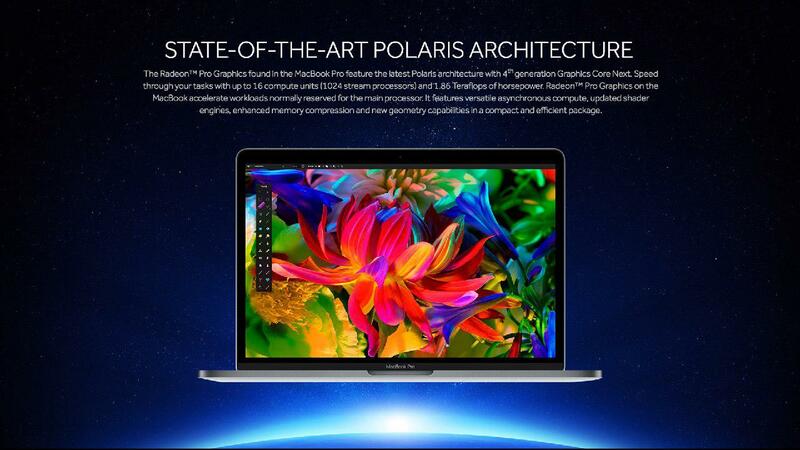 Available first in the all-new 15-inch MacBook Pro, select Radeon Pro 400 Series graphics deliver extraordinary performance and efficiency gains over the prior generation to fuel modern creative efforts from anywhere inspiration strikes. Radeon Pro 400 Series Graphics are designed specifically for today’s makers – the artists, designers, photographers, filmmakers, visualizers and engineers that shape the modern content creation era. Harnessing AMD’s acclaimed Polaris architecture, Radeon Pro 400 Series Graphics are built on the industry’s most advanced process technology for graphics processors in production today, 14nm FinFET, resulting in incredibly small transistors. To enable the thinnest graphics processor possible, AMD also employs a complex process known as ‘die thinning’ to reduce the thickness of each wafer of silicon used in the processor from 780 microns to just 380 microns, or slightly less than the thickness of four pieces of paper. Operating in a power envelope under 35W, the Radeon Pro 450, 455, and 460 Series graphics processors deliver spectacular energy efficiency and cool, quiet operation to speed through the most demanding tasks in popular creative applications. The “Meet the Creators” program will also explore how Radeon Pro graphics play a role in the creative process, from harnessing extraordinary graphics performance in today’s popular 2D and 3D creative applications, to using modern low-overhead graphics and compute APIs to accelerate rendering in today’s workflows. Maxon’s powerful and intuitive Cinema 4D application for 3D modeling, animation and rendering, providing GPU-accelerated performance on Mac by leveraging Radeon Pro graphics and Apple’s Metal API.